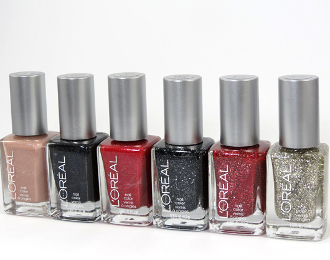 Your dream color is now at your fingertips with L'Oreal Paris Nail Color, a unique formula that delivers intense color, luxurious shine and 10-day wear. Available in a delicious spectrum of must-have shades, the collection is divided into four unique color stories. There's a perfect hue to match your personality, style and mood. L'Oreal Paris Nail Color: Ultra-finely dispersed pigments provide unparalleled coverage and hi-fidelity color intensity Innovative formula with crystal acrylics add intense clarity to magnify shine Durable film-forming polymers create glass-like clarity with 10-day resiliency Pure, intense, eye-catching colors Find your shade(s) in one of four color collections Luxurious shine in a single stroke Comes in colors: 164 Precious Coral; 240 How Romantic; 420 Devil Wears Red.